What is Nature’s Best and ecotourism? Rest day in the pen down by the creek Tjulån. Nature’s Best is the first national quality label for ecotourism in the northern hemisphere. 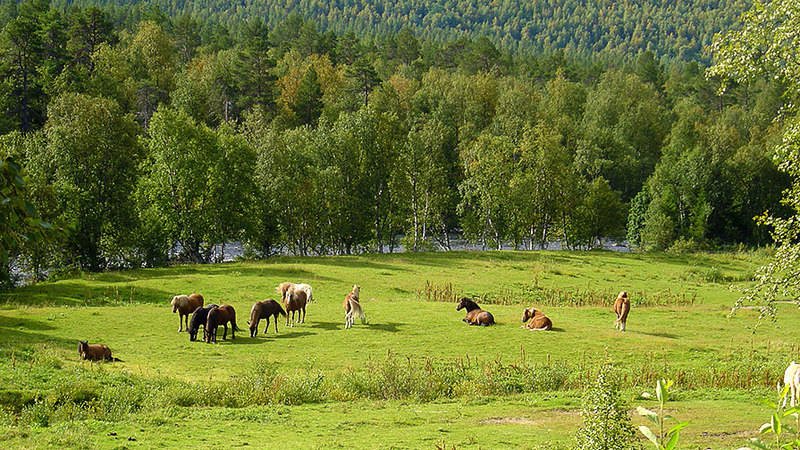 Nature’s Best is a quality label of Swedish ecotourism. The quality labeling was launched during the UN International Year of Ecotourism in 2002. The labeling is tailored to guarantee high quality of the arrangements combined with environmental protection, a more environmentally adapted way of travelling and a consideration of the destination’s cultural values. Nature’s Best is mutual label for Sweden’s most competent Swedish nature tour operators and their arrangements. Nature’s Best simply guides you to the best and most sustainable nature tours. Fjällhästen is not only a competent organizer of exclusive horseback riding tours through one of Europe’s largest wilderness areas. Simultaneously you find a Sámi dimension and for the operators it’s obvious and natural that the wellbeing of the horses and the guest’s security always are put first. Fjällhästen is labeling tour riding with Icelandic around Ammarnäs and in the Nature Reesreve of the Vindel Mountains with Nature’s Best.